We've talked quite a bit about the Icom IP501H Sim Card / LTE Two Way Radio on our blog and our Two Way Radio Show podcast, so we thought it was time to show it. 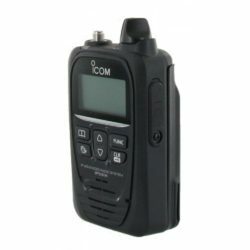 There's a lot to like about this radio, but what makes it really unique and exciting is the notion that Icom may have finally solved the two way radio range problem. Really! Want to know more? Watch the video and take a look at this radio that could become a game changer for businesses that need long range from a two way radio. The Icom IP501H is available now from Buy Two Way Radios. This entry was posted in Videos, Icom and tagged Icom, video, IP501H, LTE radio, LTE network, sim card on December 5, 2018 by Rick. Too often we hear from customers who desperately need radios that can communicate over a large distance, but they have no simple or viable options. Usually, our solution involves repeaters. While Installing one or more repeaters will often get the job done, they can also be expensive, time consuming, and may not be practical in some cases. Now, there is good news. 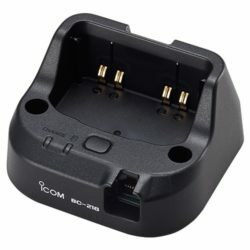 Icom has a solution. The Icom IP501H is a small and very lightweight radio that looks almost identical to Icom's original IP radio, the IP100H. However, they are not the same radio. This is a completely different animal. While the IP100H used a LAN to interconnect with other radios, the IP501H takes it to another level. 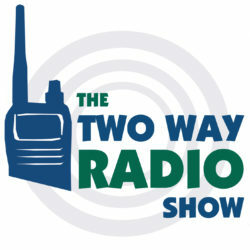 This radio attempts to solve the two way radio range problem. And it does. 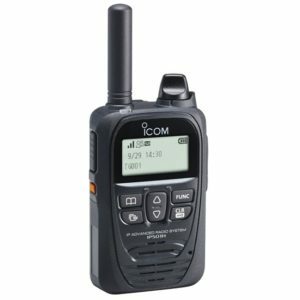 The Icom IP501H isn't your typical walkie talkie. It is an LTE radio. This small yet powerful IP based radio uses LTE networks, the same ones used by cell phones, to deliver coast to coast coverage. The IP501H uses a sim card, so anywhere you have a 4G or 3G LTE network, which is essentially nationwide in the United States, you can communicate with these radios. Range is an important difference, but what really sets the IP501H apart from other two way radios is the way it handles two way communications. A typical two way radio is a half-duplex device, which means it only allows one person to talk at a time. One operator presses the PTT button to transmit, then releases it to receive, and the other operator presses the PTT button on the next radio to transmit, and so on. The IP501H is capable of full duplex operation, which means that a user can transmit and receive simultaneously, just like a cell phone. Imagine a radio that provides instant, full duplex communication using an LTE network for telephone-type calls and conversations without the need for repeaters or a wired network. That's the Icom IP501H. Anywhere your cell phone works, the IP501H should work as well. With this in mind, there is so much potential for where it could be used. This product is perfect for companies with a fleet of vehicles, such as an HVAC company with service or repair technicians. Any company that's currently buying cell phones for employees might find that the IP501H does everything that they need and saves them money at the same time. It's also a simple solution for businesses with multiple locations that need an easy way to stay in contact. The nationwide coverage is clearly the biggest reason to buy this radio, but it's not the only one. When it comes to features, the IP501H is loaded with them. Like you would expect, it has clear digital audio, and as already mentioned, like a cell phone, it supports full duplex conversations. Yet, there is more. It features a 500 memory address book with room for individual, group, talkgroup and telephone lists. It has a vibrate alert, message recording, lone worker function, man down function, and is GPS capable. A vehicle charger is available for the IP501H that enables Bluetooth® support, allowing hands free communications via a headset. The included lithium-ion battery provides over 17 hours of operation on a single charge. This makes it a great choice for use in service trucks, and is ideal for long shifts out in the field. The IP501H is also quite durable. This is kind of a heavy duty radio for its small size. It is also IP67 dust and waterproof. Best of all, you don't need to purchase an FCC license to operate the IP501H. It's license free! But what about the price? is It a good value for the cost? The IP501H radio itself starts at $540 per unit, which is less than the cost of a lot of cell phones. There is also a monthly fee for use of the Icom's service network, called LTE Connect. The monthly fee is $28 a month per radio, but there are some contract and month-to-month packages you can work out for the radio and the service. The radios will be configured by us before they ship and will work right out of the box, with no other devices or controllers to install. It's simple and it works! If you'd like to learn more, or would like to receive a quote for IP501H radios, please contact us at 1-800-584-1445 and we'll be happy to help. This entry was posted in General, Articles, Icom and tagged Icom, IP501H, IP100H, LTE radio, LTE network, 4G network, 3G network on December 4, 2018 by Rick.